Make way for one account, and several workspaces. While in the past you may have had trouble registering a new company with an old email address, your new personal account will take care of this problem once and for all. 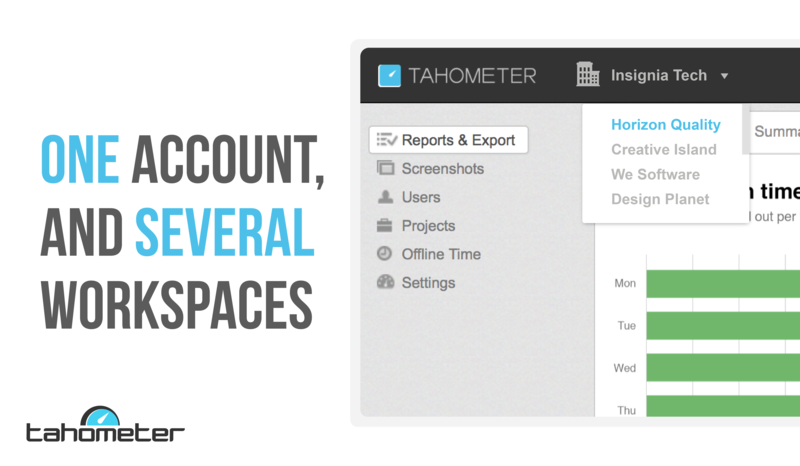 In practice, to help keep things organized, every company you add to Tahometer will behave much like a folder. All actions recorded by the time tracker will be assigned to a specific company: time entrees, projects and features — which should serve to facilitate your future payments. We are also implementing a convenient workspace switcher that allows users to easily change to the workplace of their choice. John is a freelance designer working with multiple clients. Understandably, however, he has no desire to share all his tracked hours with every single one of his clients. Instead, he only wants specific people to view the work hours that they are paying for. With Tahometer’s new feature, all John would have to do is create a separate company for each individual client. He could then add team members, designate admins, and even be invited to join other companies created by different users. In this way, John would be able to accurately reflect his work life in a single Tahometer account, as he has always had different roles to play in different organisations. Another case would be that of Susie. Because she would like to track both her personal and professional work hours, she could easily do this by simply creating two individual companies: Personal and Professional. In this way, any personal work she completes in her Personal company would not be visible from her Professional workspace, and vice versa too, of course. The same is true for payments: Users will only pay for the companies in which they are a separate admin, so every company will come with is own list of users and pricing level. This massive change has only been made possible thanks to your inestimable feedback. So as always, we continue to listen to all your ideas, concerns and suggestions. If you haven’t yet given us your two cents, feel free to use the comment section below! We look forward to hearing from you :).